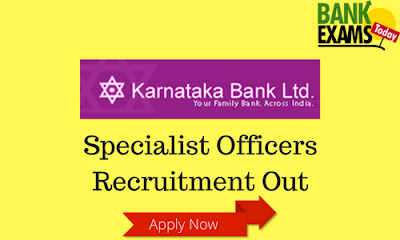 Karnataka Bank has recently released the Notification for SO posts. Applications, neatly written or typed on A4 size paper, in accordance with the specified proforma (made available on Bank’s website) along with Bio-data/CV should be sent to “The Deputy General Manager (HR & IR), Karnataka Bank Limited, Head Office, Mahaveera Circle, Kankanady, Mangaluru-575002” superscribing the envelope with “Application for the Post of ______________________”. Graduates/Post-Graduates in Agricultural Science, Horticulture & Agricultural Marketing from UGC recognized universities. Those who are awaiting results of degree examination/pursuing degree are not eligible to apply. First Class Graduates (from UGC recognized universities) with CA. Those who have completed Inter & pursuing CA may also apply. First Class Law Graduates (from UGC recognized universities) with minimum 3 years’ experience (Practice) in handling court cases. First Class Graduates with MBA-Marketing (under regular stream) from UGC recognized universities. Those who are awaiting results of the examination/pursuing PG are not eligible to apply.